I ordered the blue color and they are so pretty. They’re also are not as heavy as other brands and are mice and soft. Arrived on time, no complaints with my purchase! Copper Grove Poti Room-Darkening Window Curtain Panel Pair - 52 x 84 in. Bring a bold and dramatic look to your space with these Lush Decor room darkening curtain panels. 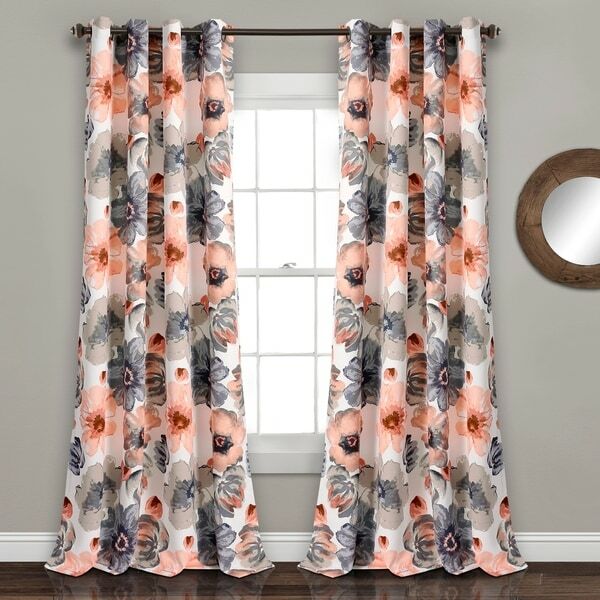 Crafted from polyester, the two curtain panels feature an abstract floral pattern, available in a variety of brilliant color options. 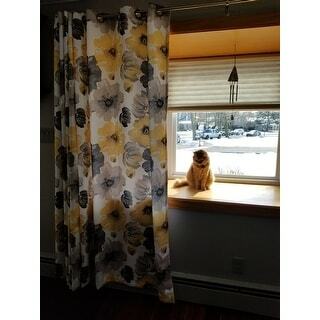 The machine-washable curtains feature grommet headers that allow for quick and easy hanging. I am in the process of decorating my new home. I have a scheme of taupe, grey, white, dark brown, and light yellow. 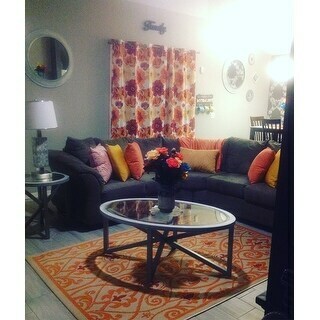 I was disappointed in my options to pull in these colors until I found these curtains. The cost (which is a great value) is well worth it. When you hold them they feel heavy; very thick and solid. They are oh so very soft, and seem to be a very wrinkle-free material (which I LOVE in a curtain). As a heads up, they are very true to color from the picture, depending on your computer screen, but do realize there is a slight hue of blue in the gray. My gray is a blue-hued gray, so it works perfect, but just make sure your grays match! They are noise-reducing; great for a room with little fabric (very acoustic rooms), they regulate temperature (insulate), are machine washable, and room darkening. They feel like great quality. I would highly recommend these to anyone interested! Beautiful colors, but description inaccurate as to the darkening part. I used it for bedroom so will need s darkening panel to block the light. These are a very heavy, expensive looking polyester material with a white backing. The are not lined and do not totally block light, but still qualify as room darkening. The only negative I have is that they run about 2 inches short. I ordered the 84 length and the fit like about 82 inches. They actually are quite beautiful, however I took off one star because of the length. Hello Everyone, can someone let me know how wide one panel is? I'm hoping for 52 inches! Love these curtians and such great reviews. I can not find the width anywhere! Help! Thanks so much. 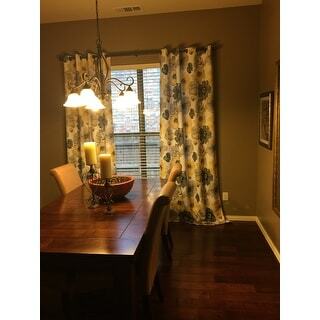 I purchased this valance to go along with the matching Luch Decor Leah panels. I am using them in my bathroom as a decorative shower curtain with a vinyl shower curtain behind them. I have extremely tall ceilings and it has been hard finding something that would reach all the way to the top of the ceiling. Ones I found were dark and one solid piece. 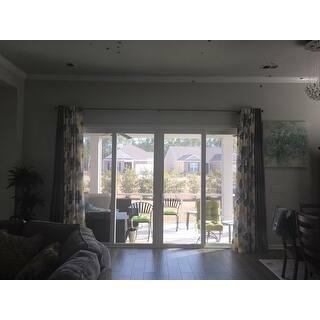 By using this curtain set I have something that is open in the middle, soft and very light in color. It has totally changed our guest bathroom for the better. Only problem is I only ordered one valance and I need two. I measured the height of the ceiling to insure the curtain panels were the correct type but I forgot to measure the width when ordering the balance. My mistake. 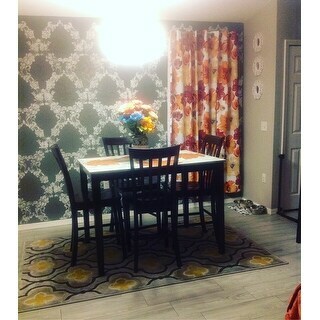 After I get an additional valance and paint the room I will attach a photo of the finished project. I was a bit apprehensive when I first saw these in person. But after I hung them on the rod I discovered how great they look. They added a punch to my Dining area that is connected to the Kitchen. 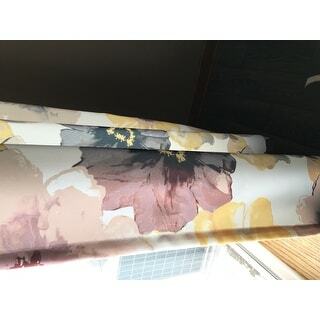 I like that they have a silky feeling to them the print looks like water color flowers on canvas. And I like the way the grommets and folds when opened take up no space. And they are machine cold water wash on gentle. I will hang dry them. These lovely panels came nicely packaged with very few wrinkles. They feel and look beautiful in my yellow and gray bedroom. I'm extremely happy with them and would encourage anyone who likes the colors to purchase. They are so worth the money! I also like that I could get them in the 95 inch length. Really beautiful accent panels for the center of my plain cream panels. Love them! The quality is superb and helps keep the rooms temperature without darkening too much! I just love everything about them ! 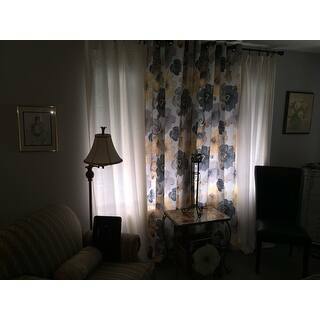 These are great, heavier, insulated curtains - but not room darkening. These look exactly like the picture, they are gorgeous! I have dark solar screens so the lightening in the picture is not great, but you can still see how beautiful they are. Not actually room darkening but they are totally beautiful ! Very happppppy ! Left two panels of the ones which were up already over the large glass sliding door and then the new panels in center. Looks custom &amp; gave a nice pop! Nice material . Not room darkening. The curtains are great but don’t match the comforter. It’s too bad cause I really love the design and fabric. Because they are so light in color that aren’t that great for room darkening. But they are beautiful and hang perfectly. Color was true to the online representation. I’m very happy with the look, just with the room darkening lining was better so I could sleep in. Love my curtains, such a great quality, wish it came with matching comforter. "Are the blue panels in the teal aqua family? These are stunning! And is the background yellow ivory or a true white? I have to make sure they will blend with my light aqua blue wall and green teal." This is more likely Aqua. The background color is true white. "Is the third color on the red/orange curtain choice yellow or beige?" "where are the leah curtains that are watercolor called navy"
"Are there 2 panels at 54 wide each for a total of 108 in the package"
Yes, there are two panels! Yes, and I got the blue and they are beautiful! "When will you have the blue and grey in a valance?" "Are these curtains lined in white"
Yes, the fabric backing is white. "I'm look to be on a notification list when you receive the blue gray in 108" length. WHEN do you think they will come in?" I have bought the 94" and the 64" and the valance. Have the matching bed quilt and love the pattern and the material.